Dead Horse Point is 2,000 feet above the Colorado River and provides a breathtaking panorama of Canyonland. 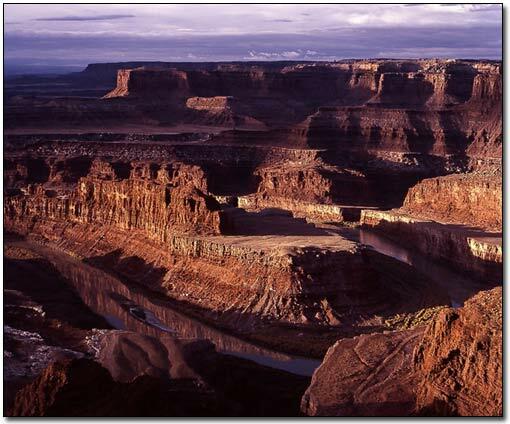 Dead Horse Point is on the same road leading to Canyonlands Island In The Sky and a place that shouldn't be missed. The many layers of geologic time may be viewed while standing on the cayon rim. It reveals over 300 million years of the earth's history. In the back of Dead Horse Point is the La Sal Mountains. The park is located on Route SR 313 about 31 miles from Moab. The park is open from 6am to 10pm daily and there is an admission charge (even if you have a national park pass). There is some camping in the park. With Deadhorse Point, you want to be there when the sun just crests the horizon. You'll be standing on the edge of a cliff, facing south, with the Colorado river, snaking it's way to the "confluence, below. Just across the river is a "gooseneck" mesa which points northward. Off to your right (west) are the cliff faces of several mesas which eventually run into Canyonlands National Park. The middle of the day or sunset just won't do any justice to the majesty of the view. I got pretty lucky with this shot because the sky was pretty overcast that day. I decided to give mother nature a try and waited it out which was fortunate for me because the clouds began to break. They were moving from the west to east and I could see a decent size opening approaching where the sun was and scrambled to get set up. I used the Mamiya but use a 135mm lens with the same filters attached. However, I didn't use a GND filter because most of the horizon was a neutral grey anyhow which would fit in with the exposure of the mesa. I was the only person at the 'point' and felt humbled by the expanse below and to the front of me. Sam (my dog) was with me on this shot too and I had to keep a close eye on her so she wouldn't fall off the cliff (we were on the other side of the protective wall and to the right of the viewing area) but, she knew to keep away from the cliff edge. I shot only one roll of 120 film this time (I think). I hope you have a great time photographing Dead Horse Park.